The MUST HAVE accessory for the serious boater who wants to enjoy their boat year-round! Why spend time and money to winterize your boat and miss out on enjoying your boat during the fall and winter months. For less money you can buy an XTREME Heater, a small and highly efficient marine bilge heater for extending boat usage during late fall and early spring. The XHEAT (Small) is for boats up to 24' and has a built in circuit breaker for boats without shore power. True forced air heaters for more accurate climate control (circulating warm air through engine compartment efficiently and consistently). Automatic thermostat turns heater on at 40°F and off at 55°F +/-3° the tightest tolerance on any bilge heater on the market. Most other heaters have a 5° tolerance on their thermostats, which can result in a dangerously low side close to freezing. Dynamic, self regulating, and therefore energy efficient and economical to use. Built to meet or exceed ABYC ignition protection standards with UL, SA, CE and VDE recognized components (this is the safest possible way today). See Certifications for more information. Long 20-foot power cord with a 3 prong plug easily reaches from heater mounting point to circuit protected outlet inside cabin. Any electrical device does require a consistent and dependable source of power to operate efficiently. A boat that is stored out of the water on a lift, or on a trailer, may require the next size larger heater for full engine compartment protection. Bilge vents need to be covered and out drive drained. 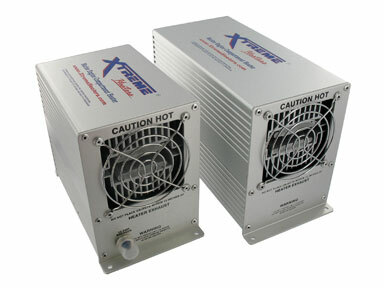 6" x 4" x 5 1/8"
*For larger boats or houseboats, you can always use 2 heaters.